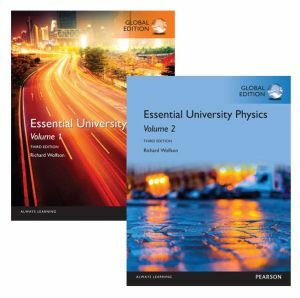 This pack contains 1 copy of Essential University Physics: Volume 1,Global edition and 1 copy Essential University Physics: Volume 2,Global edition . Richard Wolfson’s Essential University Physics, Third Edition is a concise and progressive calculus-based physics textbook that offers clear writing, great problems, and relevant real-life applications in an affordable and streamlined text. Essential University Physics teaches sound problem-solving skills, emphasizes conceptual understanding, and makes connections to the real world. Features such as annotated figures and step-by-step problem-solving strategies help students master concepts and solve problems with confidence. MasteringPhysics not included. Students, if MasteringPhysics is a recommended/mandatory component of the course, please ask your instructor for the correct ISBN and course ID. MasteringPhysics should only be purchased when required by an instructor. Instructors, contact your Pearson representative for more information.